HitFilm Pro comes bundled with Ignite Pro, which is a plug-in that brings HitFilm’s graphic effects goodness to whatever professional video editing application you use. This professional video editing software has a learning curve, but that’s to be expected with a program that does as much as this one can. In case you have collected some DVD discs and would like import DVD footage into HitFilm Pro for additional editing, you have come to the right place. This tutorial will present you best DVD to HitFilm Pro workflow for you guys. As a powerful video editing software, HitFilm Pro supports a wide range of video formats including Quicktime, AVCHD, AVI, M2T, M2TS, MOV, MP4 (AVC/H264 & AAC), MPEG-1 & MPEG-2 and more as input. Unforturnately, the commercial and encrypted DVD discs are not in the queue. To work HitFilm Pro edit DVD footage smoothly, we advise you rip and convert DVD to HitFilm Pro supported video formats in advance. To finish the task, Brorsoft DVD Ripper for (Windows/Mac) can do such big favor for you. With it, you can bypass copy protections from DVD discs and rip DVD to HitFilm Pro supported video formats without losing original quality. In addition, you can also convert DVD videos to an edit-friendly format like: DNxHD for Avid Media Composer, MPEG-2 for Adobe Premiere Pro, ProRes.mov for FCPX and more. Free download and launch the DVD to HitFilm Pro converter, and click the “Load disc” button to load the DVD movies to the program. Click the drop down box of “Format”, and select Hitfilm preferred MP4, WMV, MOV, MPEG-2, AVI, etc formats from “Common Video” category. Tips: If you need, you can also click “Settings” to modify parameters of your output profile to meet your professional needs: bit rate, frame rate, aspect ratio, etc. When everything is ok, tap the big “Convert” button to rip/convert DVD to Hitfilm Pro compatible video formats. 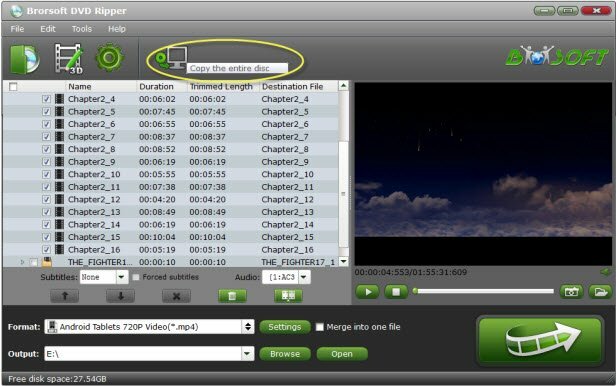 Once finished, click the Open button to quickly locate the ripped files, then you have no hassle to import and edit the converted DVD footage with HitFilm Pro smoothly.